April does double duty in San Francisco as the first full month of spring and the time when many events that will continue through summer get their auspicious start. Accordingly, this year brings a good mix of spring festivities and ongoing outdoor activities. This April also marks the 100th anniversary of the earthquake of 1906, and is the city’s 150th birthday. Because it’s still the shoulder season, competition for hotel rooms and crowds at attractions are less of an issue than during the summer high season. Though San Francisco doesn’t have to thaw after winter, April still brings a marked change in weather with less rainfall and warmer days than its (admittedly mild) winter. Temperatures tend to hover between the 50s and the low 60s, with less fog than during summer. April 18 marks the 100th anniversary of the 1906 San Francisco earthquake and fire. Though it may seem strange to celebrate a major disaster, the city looks upon the centennial as a chance to “commemorate, celebrate, and educate.” More than 100 events are planned between April 14 and 22, and include exhibitions of old photographs and recorded personal accounts, as well as walking tours, performances, and talks in San Francisco and around the Bay Area. And, the newly reopened de Young Museum in Golden Gate Park is displaying artist Andy Goldsworthy’s site-specific installation “Faultline” in its entry court. San Francisco’s Japantown, which celebrates its 100th birthday this year, is one of only three Japantowns in the country. April brings the annual Cherry Blossom Festival, which takes place on the weekends of April 15 and April 22, and will include the Grand Parade with hundreds of performers from California and Japan, a street fair, cultural exhibits, and a food bazaar. Most of these events are free. Outdoor bistro dining, kids games, and a parade with roller-blading cows are just some of the things that visitors might find at the Union Street Spring Festival celebration and Easter Parade. This popular free event takes place on April 16 between Gough and Steiner on Union Street, an area known the rest of the year for its restaurants and shopping. San Francisco is full of outdoor activities year-round, but April is the first month for many of the city’s ongoing summer events. April 6th is Opening Day for the San Francisco Giants baseball team at AT&T (formerly SBC) Park. Tickets start under $15 for bleacher seats. It may be the only place in the country where home runs are retrieved by kayakers. The park is Wi-Fi enabled, and if you’re not in the mood for ballpark dogs you can grab sushi, local garlic fries, burritos, or a hot fudge sundae instead. Starting on April 23rd, the Golden Gate Park Band will be playing free public concerts on Sundays at 1:00 on the lawn near the fountain at Strybing Arboretum in Golden Gate Park. Concerts last about two hours and include everything from opera to big band swing classics. This season, the band is also incorporating local dance groups and singers into some of its performances. Picnics are encouraged, and entry into the arboretum is free. Opening Day on the Bay on April 30th marks the first official day of boating season. Landlubbers can celebrate from shore by watching the annual boat parade, when around 250 decorated boats ply the waters between Crissy Field and Pier 39. The boat brigade will be led by one of San Francisco’s own fire boats. Not all of the fanfare of spring happens outdoors. The 49th San Francisco International Film Festival begins in darkened theaters around the city on April 20. The event will feature nearly 200 films from 50 countries. The festival will close this year with a screening of Robert Altman’s new movie A Prairie Home Companion, based on Garrison Keillor’s long-running radio show. Matinee rates to festival films are available, and there are senior and student discounts as well. April is an ideal month for maximum value in a San Francisco vacation. Activities abound, the weather is generally pleasant, and, as the final month of shoulder season before the summer high season, it’s a fine time to find reasonable prices on travel. The San Francisco Convention and Visitors Bureau is offering a series of discounts through June 30 to Visa credit card holders. More than 300 offers are available, including discounts or perks at a variety of restaurants, a 10 percent discount on ATA flights to San Francisco, and reduced-price city tours. The Kimpton Boutique Hotel chain runs a hot dates, great rates campaign that offers discounted rates on accommodations for certain dates. Ten San Francisco hotels are listed in the program, and many of them, at press time, had available dates in April, including rates of $99 at the Hotel Serrano, $129 at the Hotel Triton, and $169 at the Hotel Palomar. The [% 297806 | | Omni Hotel %] downtown is also running a special through April, offering 20 percent discounts off the regular rate and late check out. April in the city is shaping up to be busy, fun, and affordable. And a spring visit means avoiding Mark Twain’s coldest winter, better known as the summer he spent in San Francisco. 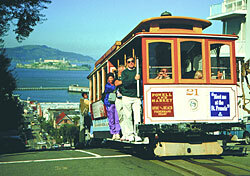 SmarterTravel.com keeps track of the current airfare and hotel offers to and in San Francisco. And the San Francisco destination guide offers more insight into visiting the city at any time of year.